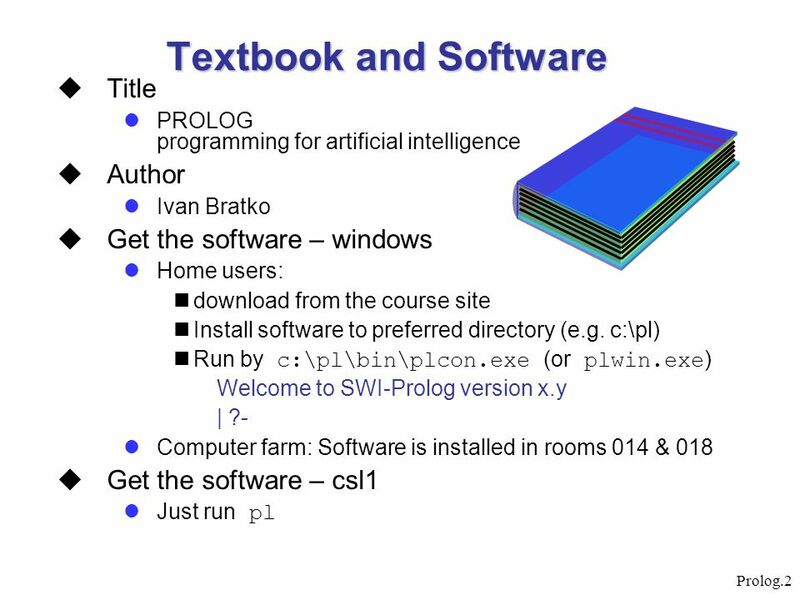 PROLOG programming for artificial intelligence Author Ivan Bratko Get the software – windows Home users: download from the course site Install software to preferred directory (e.g. c:\pl) Run by c:\pl\bin\plcon.exe (or plwin.exe) Welcome to SWI-Prolog version x.y | ?- Computer farm: Software is installed in rooms 014 & 018 Get the software – csl1 Just run pl PROgramming LOGic What is a program in PROLOG – defining axioms and rules and then asking questions. 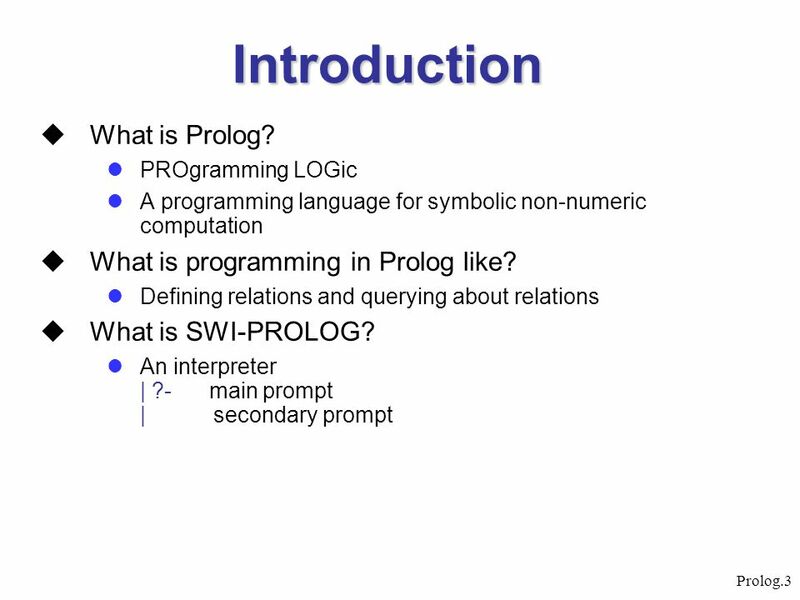 3 Introduction What is Prolog? 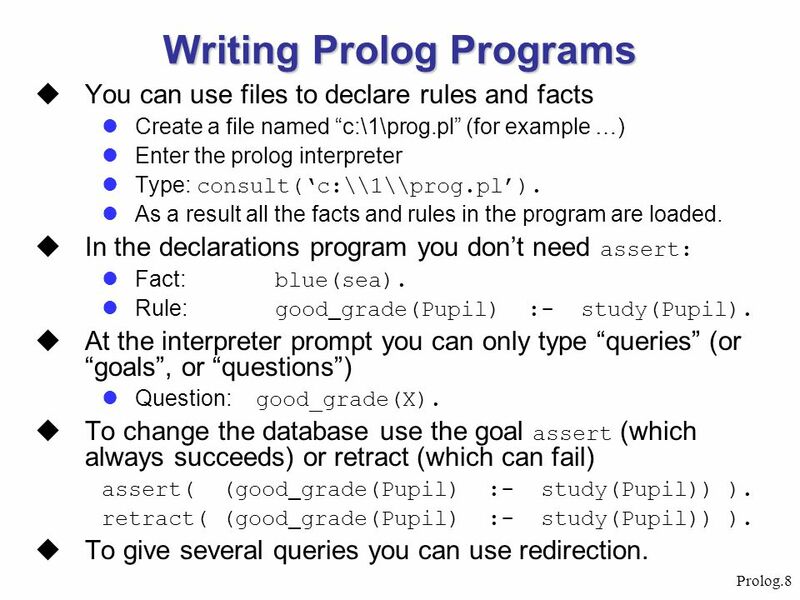 What is programming in Prolog like? 5 More Parameters assert(eats(bear,honey)). assert(eats(bear,salmon)). assert(eats(rat, salmon)). assert(eats(salmon, worm)). Logical AND: Who eats both honey and salmon: Which X eats honey and the same X eats salmon? eats(X,salmon) , eats(X,honey). X = bear. 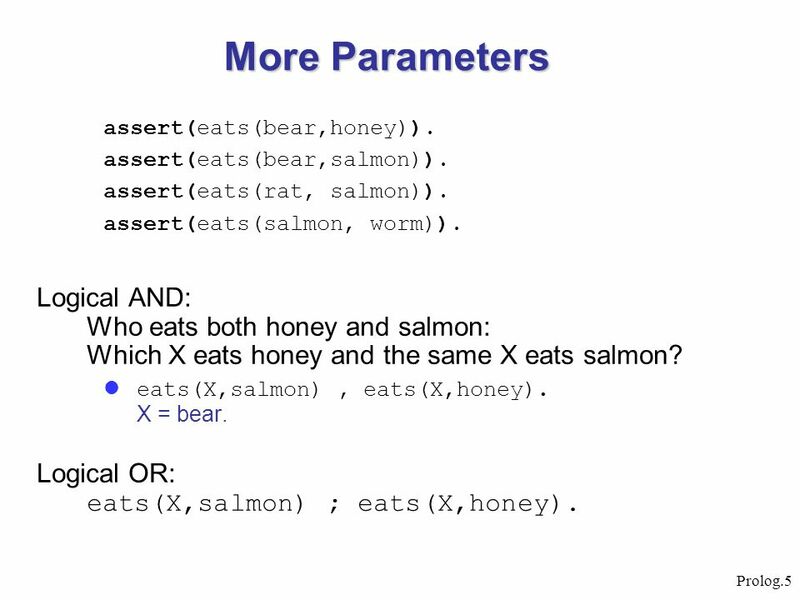 Logical OR: eats(X,salmon) ; eats(X,honey). For all X and Y, X’s survival depends on Y’s existence if : X eats Y OR X eats some Z and Z’s survival depends on Y’s existence. 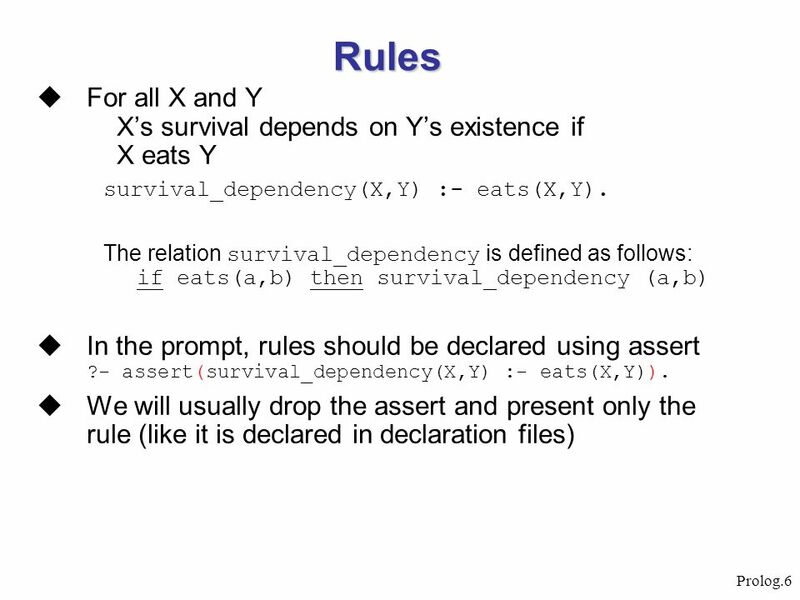 survival_dependency(X,Y) :- eats(X,Y). 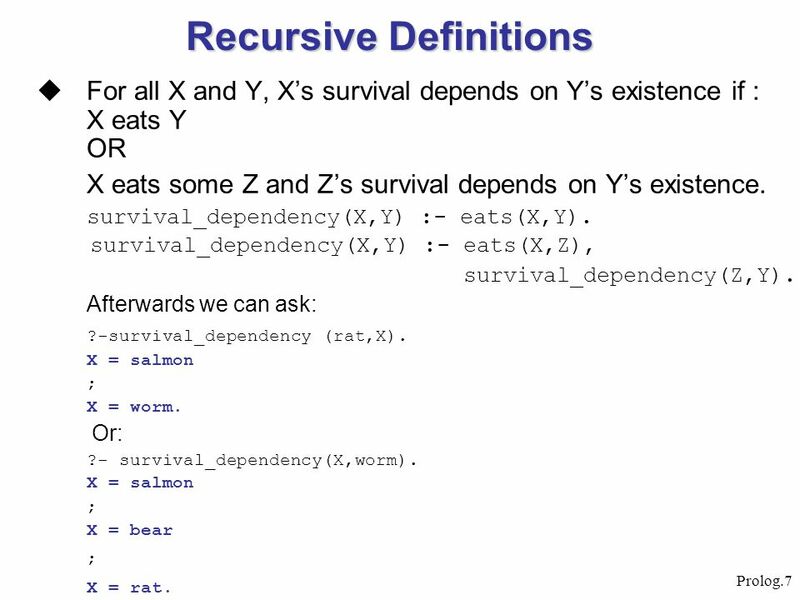 survival_dependency(X,Y) :- eats(X,Z), survival_dependency(Z,Y). 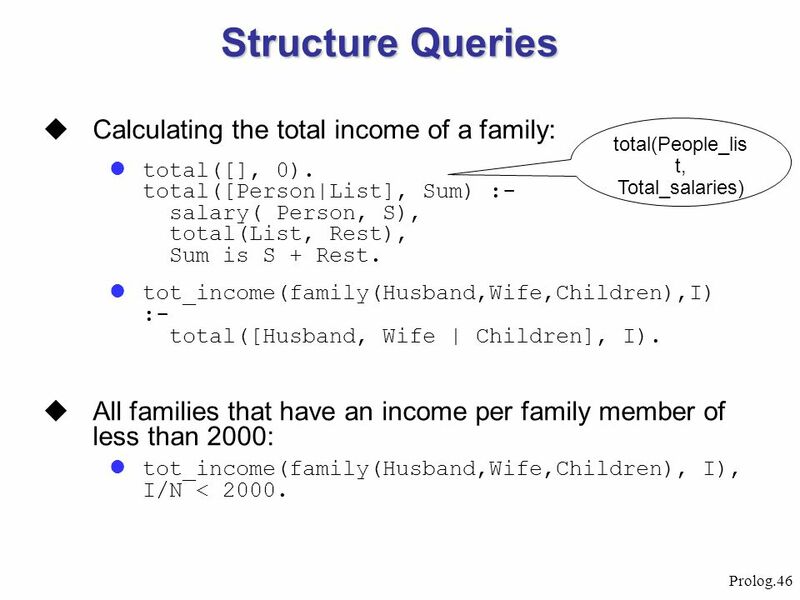 Afterwards we can ask: ?-survival_dependency (rat,X). X = salmon ; X = worm. Or: ?- survival_dependency(X,worm). X = bear X = rat. You can use files to declare rules and facts Create a file named “c:\1\prog.pl” (for example …) Enter the prolog interpreter Type: consult(‘c:\\1\\prog.pl’). As a result all the facts and rules in the program are loaded. 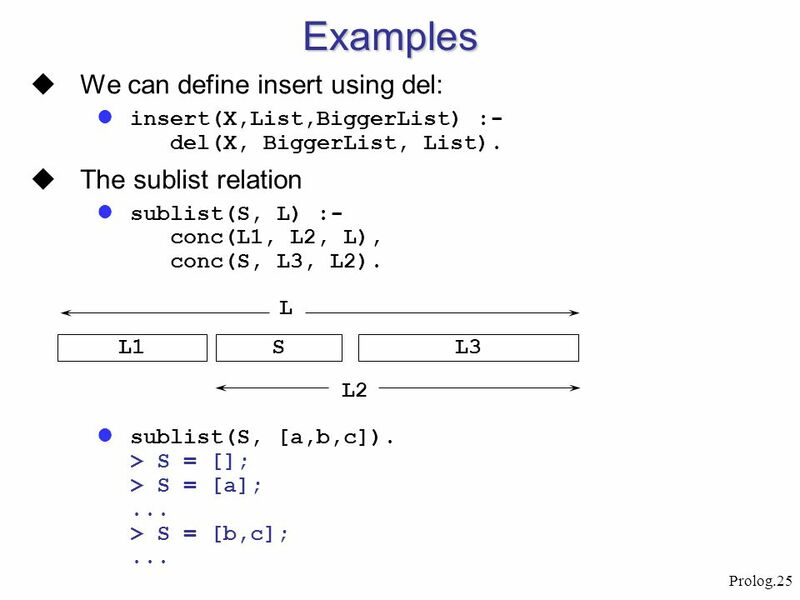 In the declarations program you don’t need assert: Fact:	blue(sea). Rule:	good_grade(Pupil) :- study(Pupil). 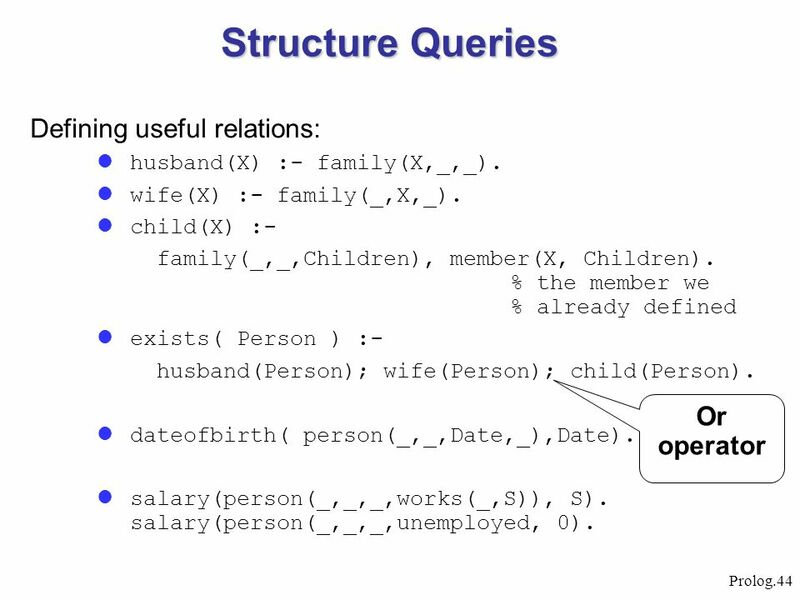 At the interpreter prompt you can only type “queries” (or “goals”, or “questions”) Question: good_grade(X). To change the database use the goal assert (which always succeeds) or retract (which can fail) assert( (good_grade(Pupil) :- study(Pupil)) ). retract( (good_grade(Pupil) :- study(Pupil)) ). To give several queries you can use redirection. 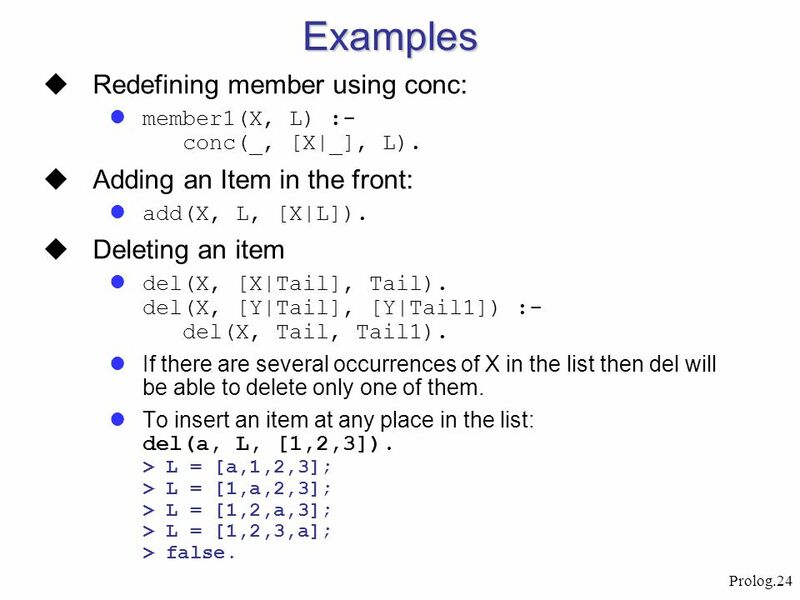 Parameters to rules can be constants or variables – pattern matching similar to ML. they are identical, or the variables in both terms can be instantiated to objects in such a way that after the substitution of variables by these objects the terms become identical. 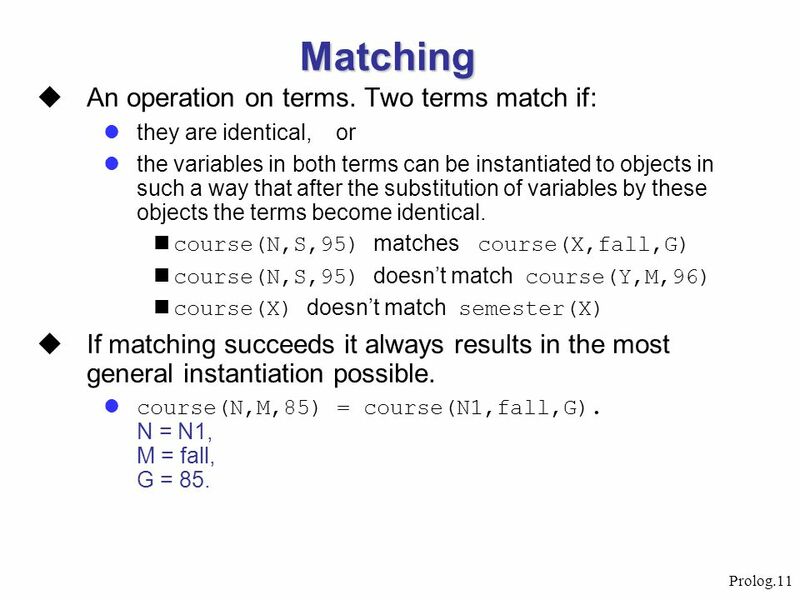 course(N,S,95) matches course(X,fall,G) course(N,S,95) doesn’t match course(Y,M,96) course(X) doesn’t match semester(X) If matching succeeds it always results in the most general instantiation possible. course(N,M,85) = course(N1,fall,G). N = N1, M = fall, G = 85. Matching is on both sides. If S and T are constants, then S and T match iff they are the same atom, or the same number. 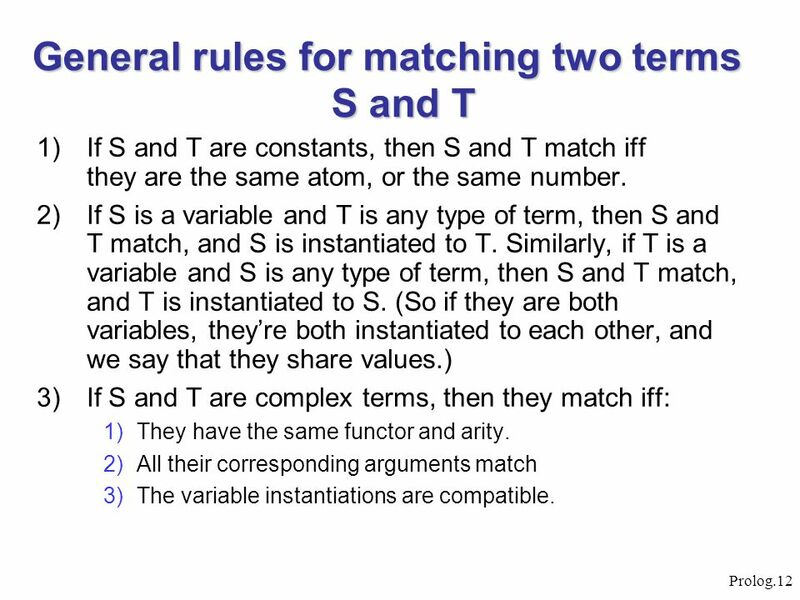 If S is a variable and T is any type of term, then S and T match, and S is instantiated to T. Similarly, if T is a variable and S is any type of term, then S and T match, and T is instantiated to S. (So if they are both variables, they’re both instantiated to each other, and we say that they share values.) If S and T are complex terms, then they match iff: They have the same functor and arity. 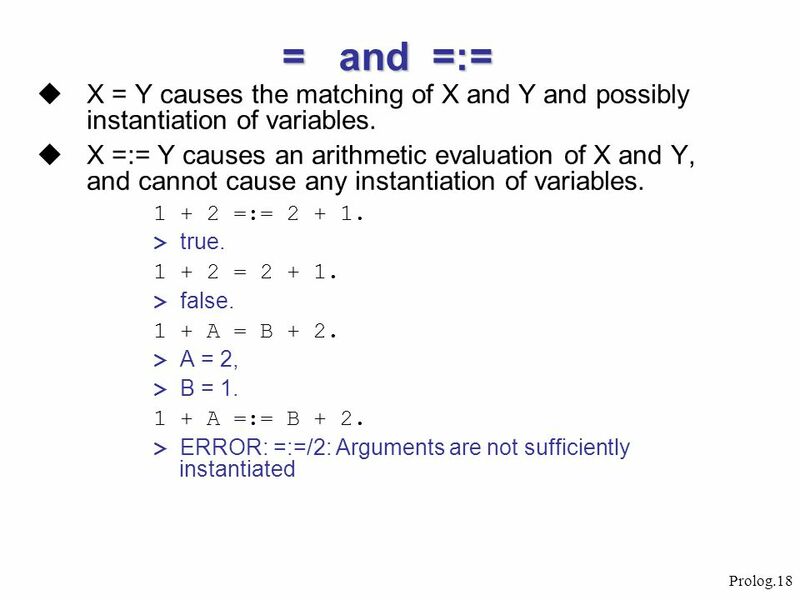 All their corresponding arguments match The variable instantiations are compatible. 13 Geometric Example Use structures to represent simple geometric shapes. point - two numbers representing X and Y coordinates. seg - a line defined by two points triangle - defined by three points. 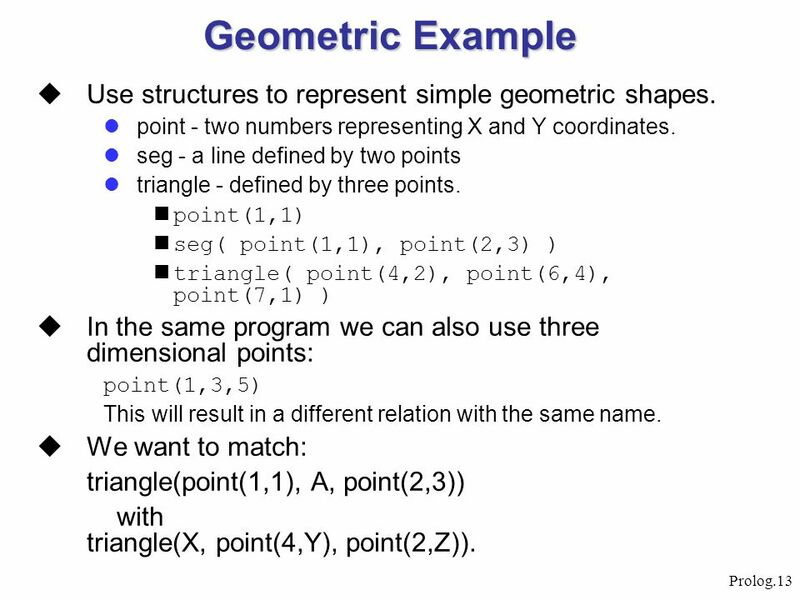 point(1,1) seg( point(1,1), point(2,3) ) triangle( point(4,2), point(6,4), point(7,1) ) In the same program we can also use three dimensional points: point(1,3,5) This will result in a different relation with the same name. We want to match: triangle(point(1,1), A, point(2,3)) with triangle(X, point(4,Y), point(2,Z)). 14 Geometric Example triangle(point(1,1), A, point(2,3)) = triangle(X, point(4,Y), point(2,Z)). 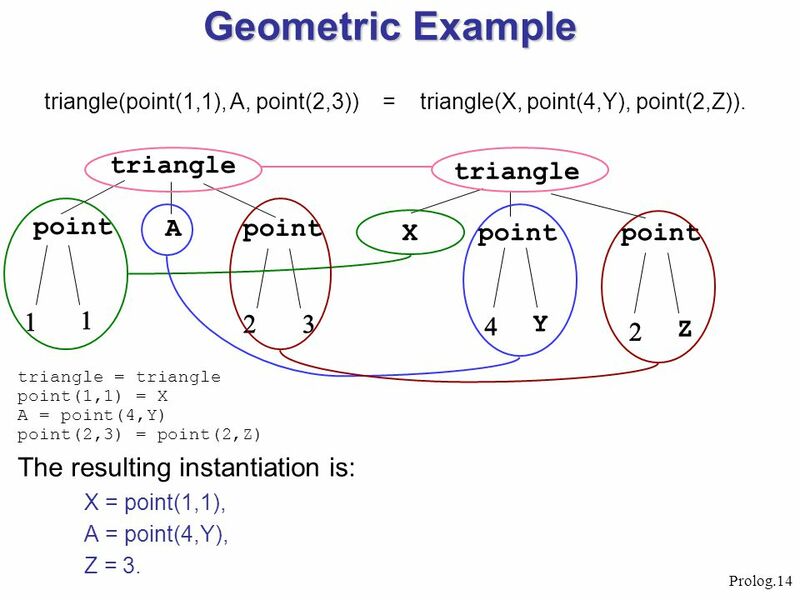 triangle point A 1 2 3 triangle point X Y Z 4 2 triangle = triangle point(1,1) = X A = point(4,Y) point(2,3) = point(2,Z) The resulting instantiation is: X = point(1,1), A = point(4,Y), Z = 3. 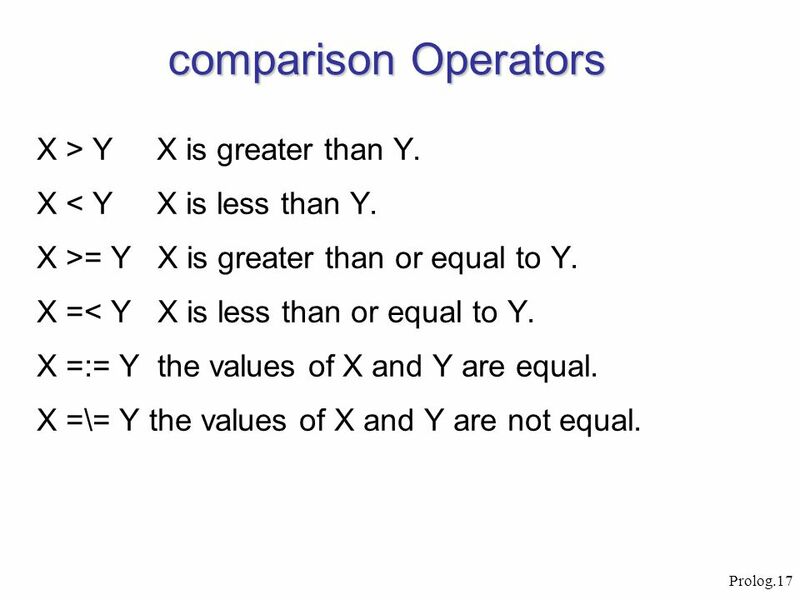 17 comparison Operators X > Y X is greater than Y.
given X and Y, the gcd D can be found by: (1) If X and Y are equal then D is equal to X. (2) If X < Y then D is equal to the gcd of X and (Y-X). (3) If Y < X then do the same as in (2) with X and Y interchanged. 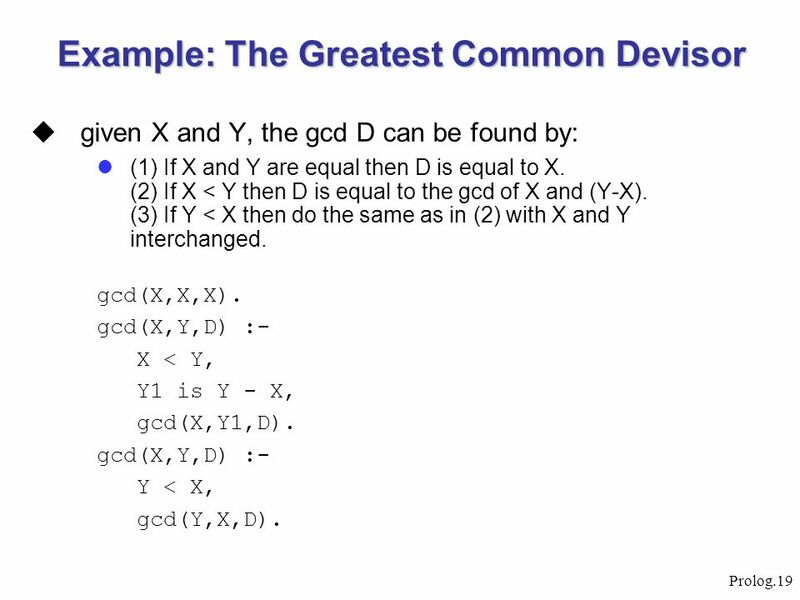 gcd(X,X,X). gcd(X,Y,D) :- X < Y, Y1 is Y - X, gcd(X,Y1,D). Y < X, gcd(Y,X,D). 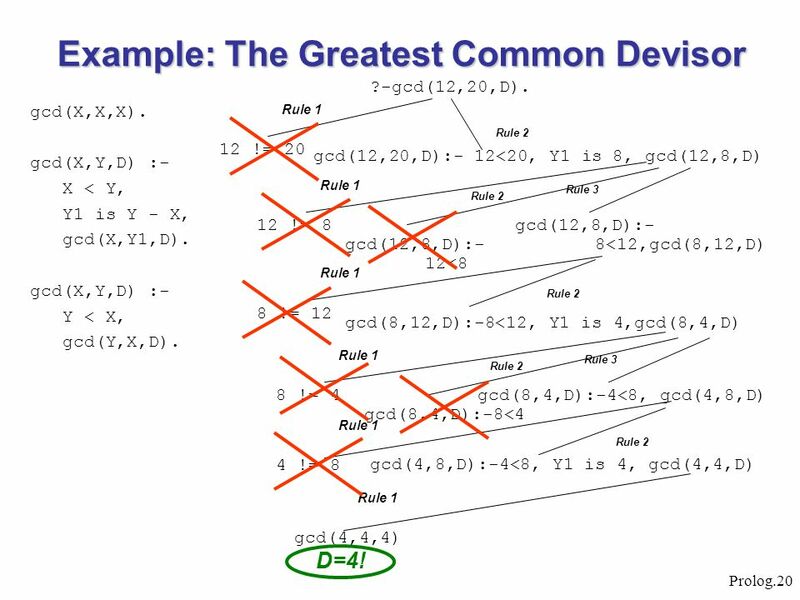 What will happen if we’ll write gcd([1,2],[1,2],X). ? ?-gcd(12,20,D). gcd(X,X,X). gcd(X,Y,D) :- X < Y, Y1 is Y - X, gcd(X,Y1,D). Y < X, gcd(Y,X,D). Rule 1 12 != 20 gcd(12,20,D):- 12<20, Y1 is 8, gcd(12,8,D) Rule 2 Rule 1 12 != 8 gcd(12,8,D):- 12<8 Rule 2 gcd(12,8,D):- 8<12,gcd(8,12,D) Rule 3 Rule 1 8 != 12 gcd(8,12,D):-8<12, Y1 is 4,gcd(8,4,D) Rule 2 Rule 1 8 != 4 gcd(8,4,D):-8<4 Rule 2 gcd(8,4,D):-4<8, gcd(4,8,D) Rule 3 Rule 1 4 != 8 What will happen if we’ll write gcd([1,2],[1,2],X). ? gcd(4,8,D):-4<8, Y1 is 4, gcd(4,4,D) Rule 2 Rule 1 gcd(4,4,4) D=4! 21 Lists A sequence of any number of items. 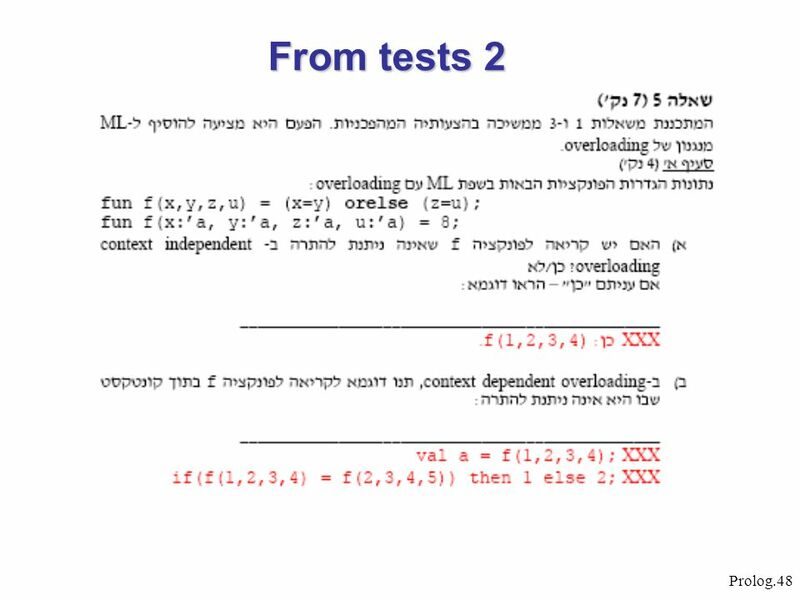 Structure of lists: . ( Head, Tail ) .(a, . (b,[ ])) eq. Shorthand: [tom, jerry] is the same as .(tom, . (jerry, )) [a | tail] is the same as . (a, tail) [a,b,c] = [a | [b,c]] = [a,b | [c]] = [a,b,c |] Elements can be lists and structures: [a, [1, 2, 3], tom, 1995, date(1,may,1995) ] a b  .
member1(X, L) :- conc(_, [X|_], L). Adding an Item in the front: add(X, L, [X|L]). Deleting an item del(X, [X|Tail], Tail). del(X, [Y|Tail], [Y|Tail1]) :- del(X, Tail, Tail1). If there are several occurrences of X in the list then del will be able to delete only one of them. To insert an item at any place in the list: del(a, L, [1,2,3]). > L = [a,1,2,3]; > L = [1,a,2,3]; > L = [1,2,a,3]; > L = [1,2,3,a]; > false. 26 Permutations permutation(, ). 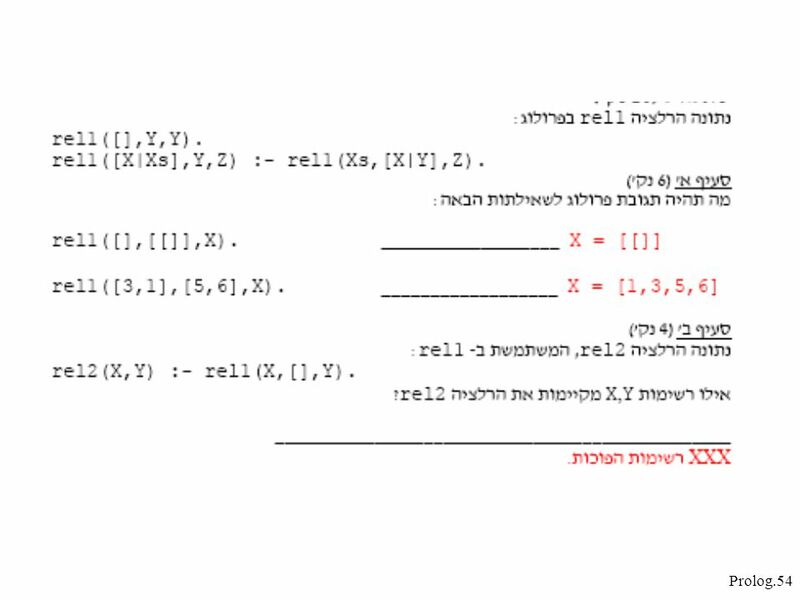 permutation([X|L], P) :- permutation(L, L1), insert(X, L1, P). 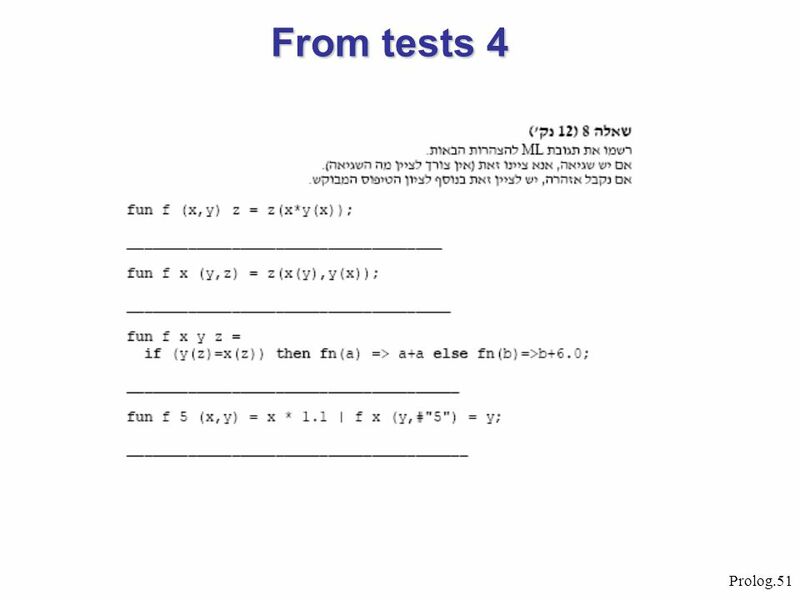 permutation( [a,b,c], P). > P = [a,b,c]; > P = [a,c,b]; > P = [b,a,c]; ... permutation2(, ). 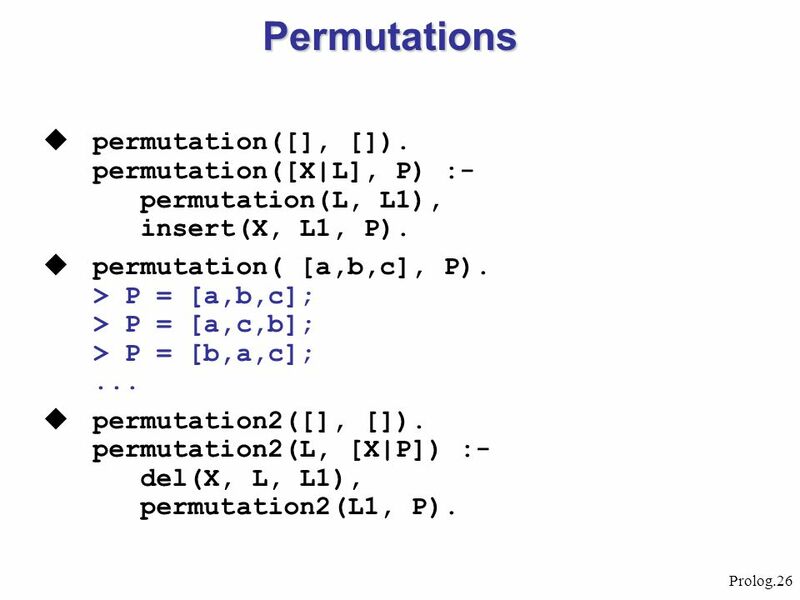 permutation2(L, [X|P]) :- del(X, L, L1), permutation2(L1, P). 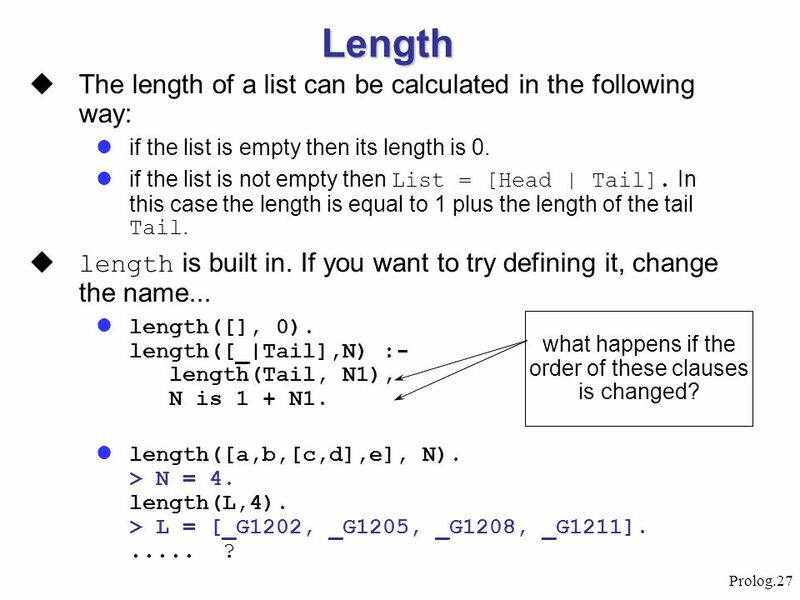 if the list is empty then its length is 0. if the list is not empty then List = [Head | Tail]. In this case the length is equal to 1 plus the length of the tail Tail. length is built in. If you want to try defining it, change the name... length(, 0). length([_|Tail],N) :-	length(Tail, N1), N is 1 + N1. length([a,b,[c,d],e], N). > N = 4. length(L,4). > L = [_G1202, _G1205, _G1208, _G1211] ? what happens if the order of these clauses is changed? 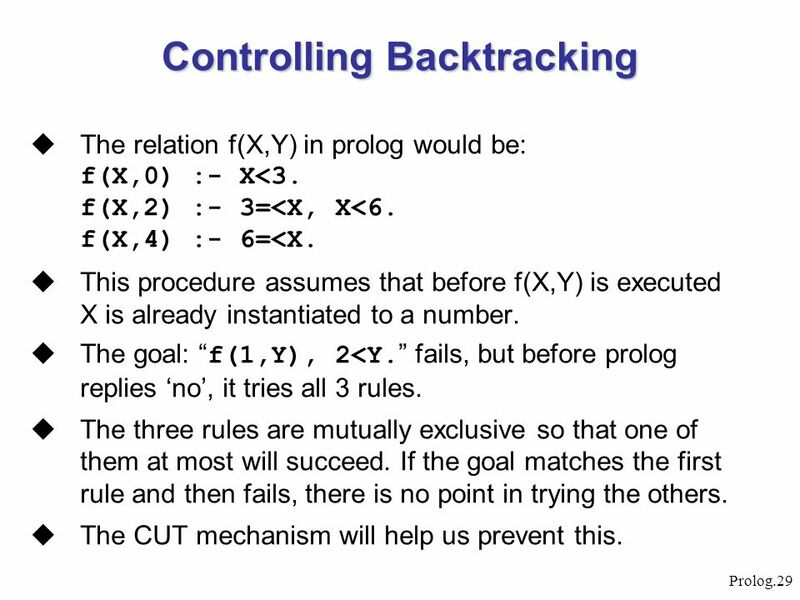 Use trace to see how prolog calculates. The relation f(X,Y) in prolog would be: f(X,0) :- X<3. f(X,2) :- 3=<X, X<6. f(X,4) :- 6=<X. This procedure assumes that before f(X,Y) is executed X is already instantiated to a number. 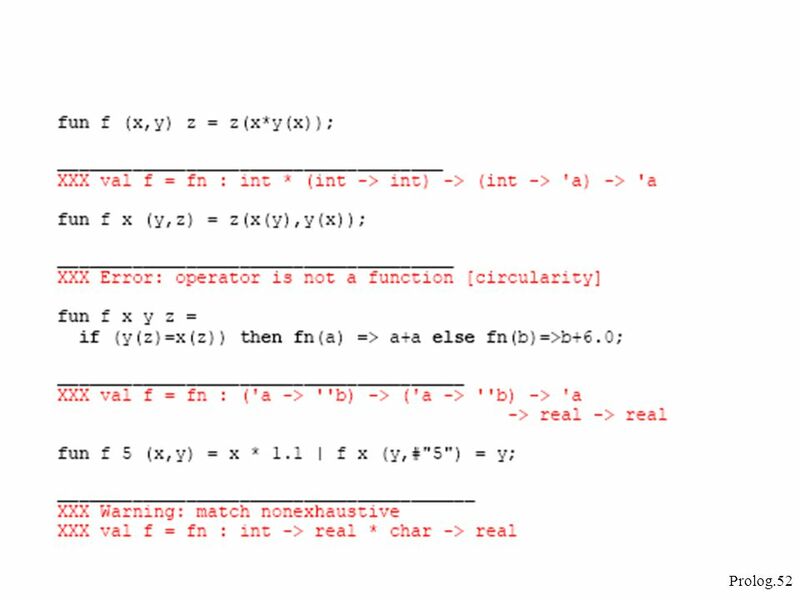 The goal: “f(1,Y), 2<Y.” fails, but before prolog replies ‘no’, it tries all 3 rules. The three rules are mutually exclusive so that one of them at most will succeed. If the goal matches the first rule and then fails, there is no point in trying the others. The CUT mechanism will help us prevent this. A cut prevents backtracking from some point on. Written as a ‘!’ sub-goal that always succeeds, but prevents backtracking through it. Correcting the example: f(X,0) :- X<3, !. f(X,2) :- 3=<X, X<6, !. f(X,4) :- 6=<X. Whenever the goal f(X,Y) is encountered, only the first rule that matches will be tried. If we now ask again “f(2,Y), 2<Y.” we will get the same answer, ‘no’, but only the first rule of ‘f’ will be tried, note: the declarative meaning of the procedure did not change. Another problem: If we ask: f(7,Y). > Y=4. What happened: 7<3 --> fail 3=<7, 7<6 --> fail 6=<7 --> success. Another improvement: The logical rule if X<3 then Y=0, otherwise if X<6 then Y=2, otherwise Y=4. Is translated into: f(X,0) :- X<3, !. f(X,2) :- X<6, !. f(X,4). The last change improved efficiency. BUT, removing the cuts now will change the result !!! f(1,Y). > Y = 0; > Y = 2; > Y = 4. 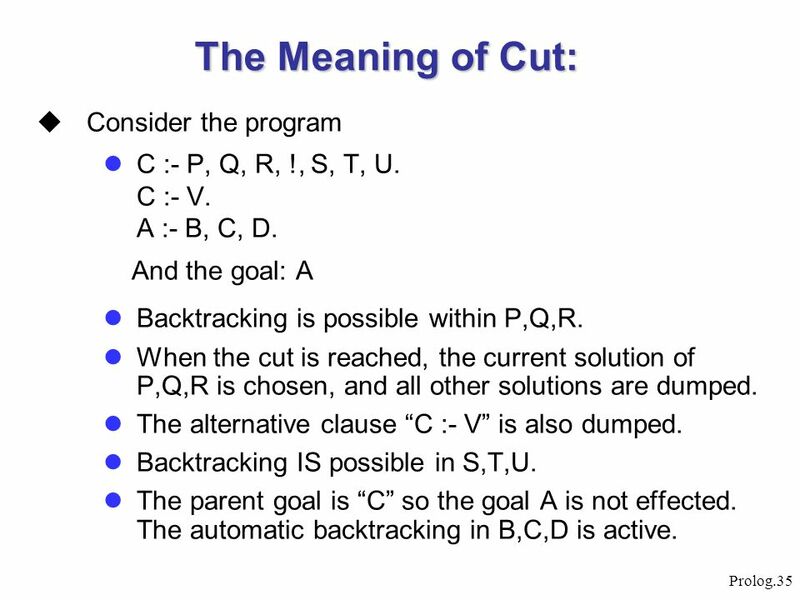 In this version the cuts do not only effect the procedural meaning of the program, but also change the declarative meaning. 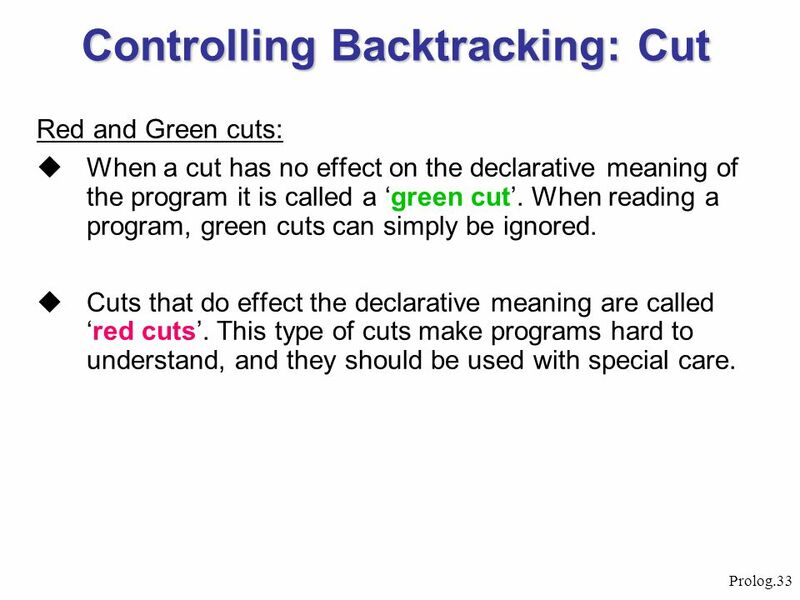 Red and Green cuts: When a cut has no effect on the declarative meaning of the program it is called a ‘green cut’. When reading a program, green cuts can simply be ignored. Cuts that do effect the declarative meaning are called ‘red cuts’. This type of cuts make programs hard to understand, and they should be used with special care. 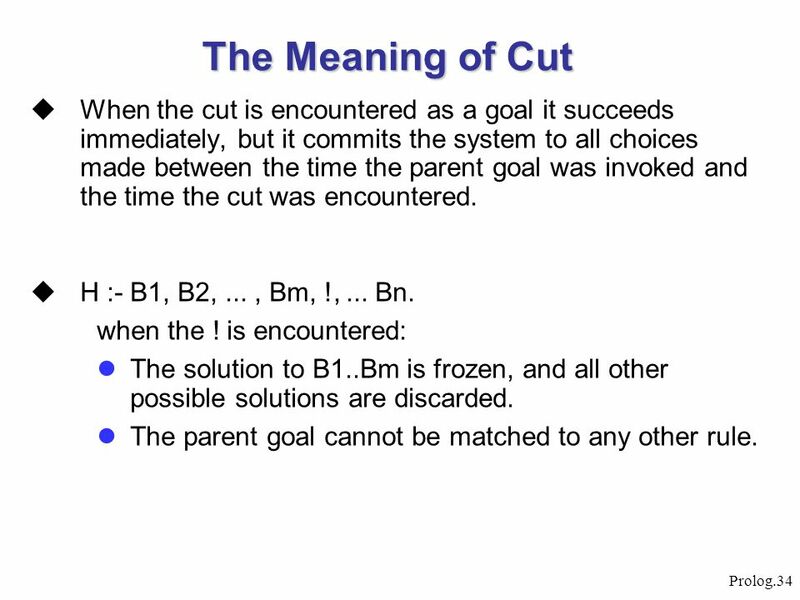 34 The Meaning of Cut When the cut is encountered as a goal it succeeds immediately, but it commits the system to all choices made between the time the parent goal was invoked and the time the cut was encountered. H :- B1, B2, ... , Bm, !, ... Bn. when the ! is encountered: The solution to B1..Bm is frozen, and all other possible solutions are discarded. The parent goal cannot be matched to any other rule. C :- P, Q, R, !, S, T, U. 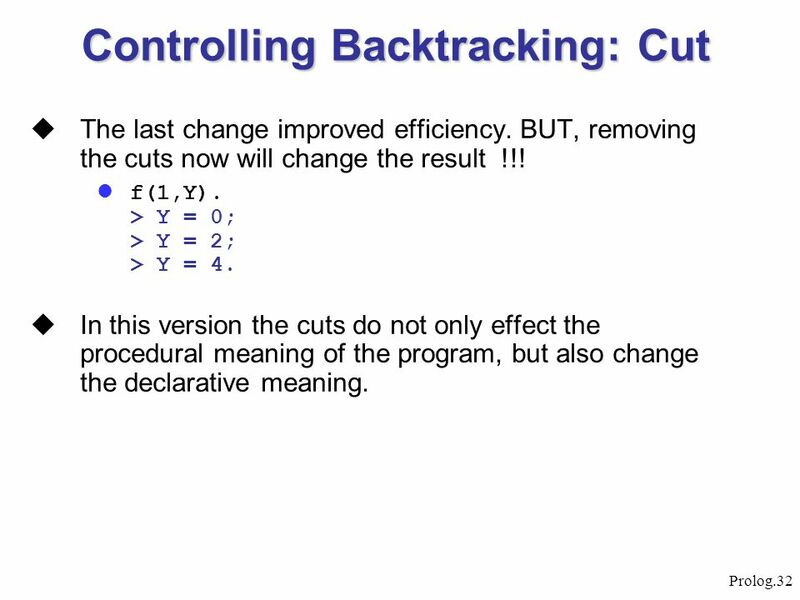 C :- V. A :- B, C, D. And the goal: A Backtracking is possible within P,Q,R. When the cut is reached, the current solution of P,Q,R is chosen, and all other solutions are dumped. The alternative clause “C :- V” is also dumped. 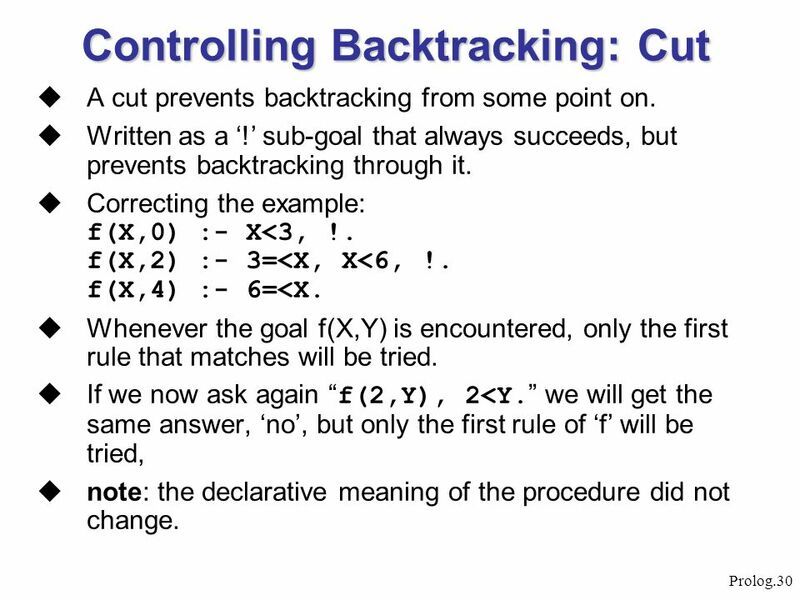 Backtracking IS possible in S,T,U. The parent goal is “C” so the goal A is not effected. 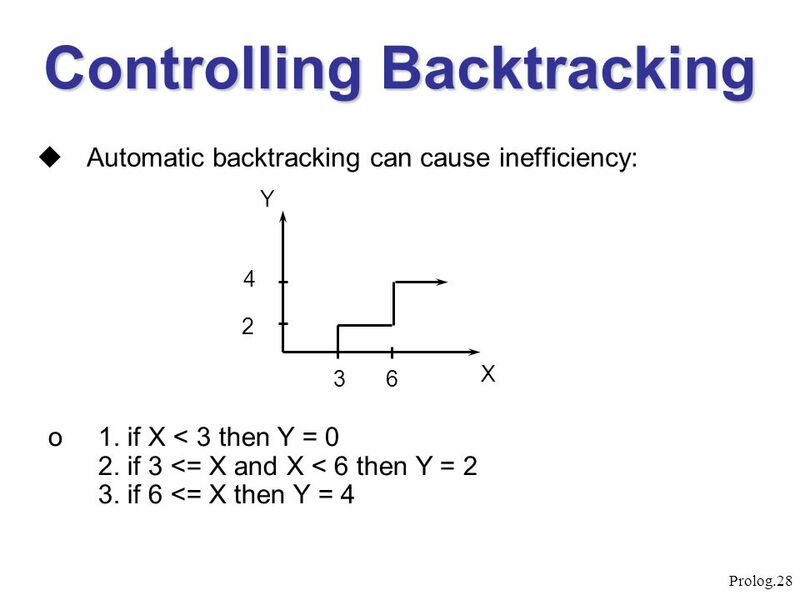 The automatic backtracking in B,C,D is active. 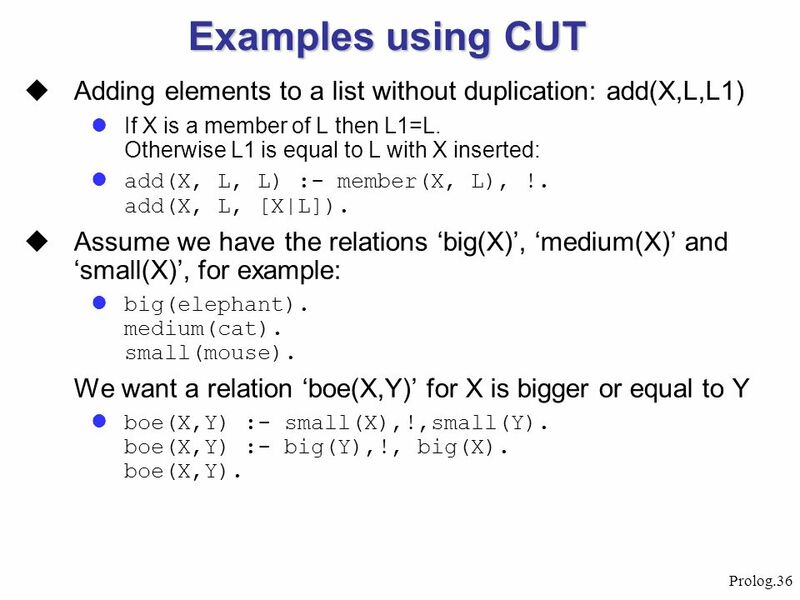 36 Examples using CUT Adding elements to a list without duplication: add(X,L,L1) If X is a member of L then L1=L. Otherwise L1 is equal to L with X inserted: add(X, L, L) :- member(X, L), !. add(X, L, [X|L]). Assume we have the relations ‘big(X)’, ‘medium(X)’ and ‘small(X)’, for example: big(elephant). medium(cat). small(mouse). We want a relation ‘boe(X,Y)’ for X is bigger or equal to Y boe(X,Y) :- small(X),!,small(Y). boe(X,Y) :- big(Y),!, big(X). boe(X,Y). The special goal true always succeeds. ( like 1=1. ) 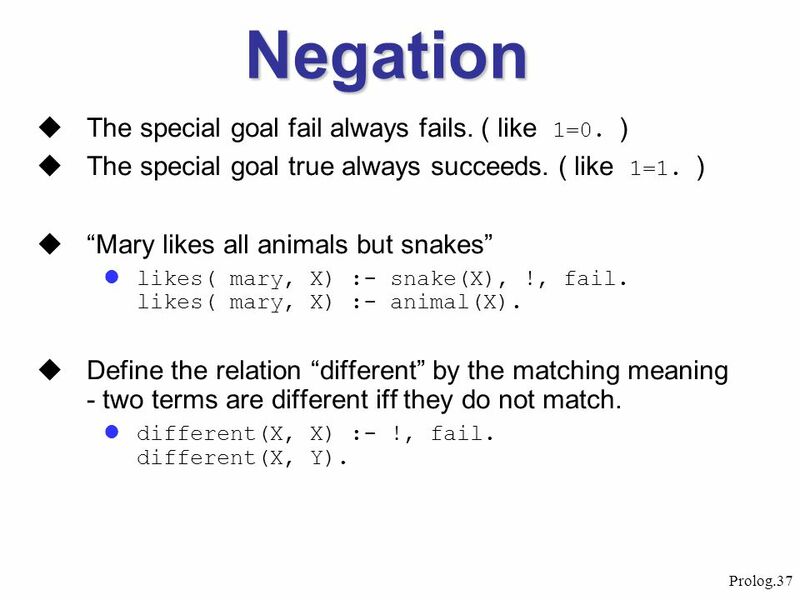 “Mary likes all animals but snakes” likes( mary, X) :- snake(X), !, fail. 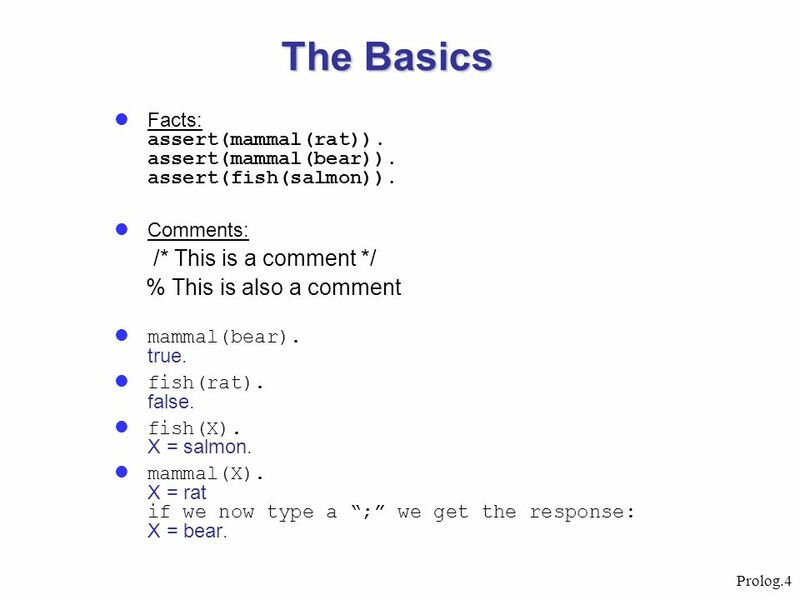 likes( mary, X) :- animal(X). Define the relation “different” by the matching meaning - two terms are different iff they do not match. different(X, X) :- !, fail. different(X, Y). if Goal succeeds then not(Goal) fails. Otherwise not(Goal) succeeds. not(P) :- P, !, fail. not(P). 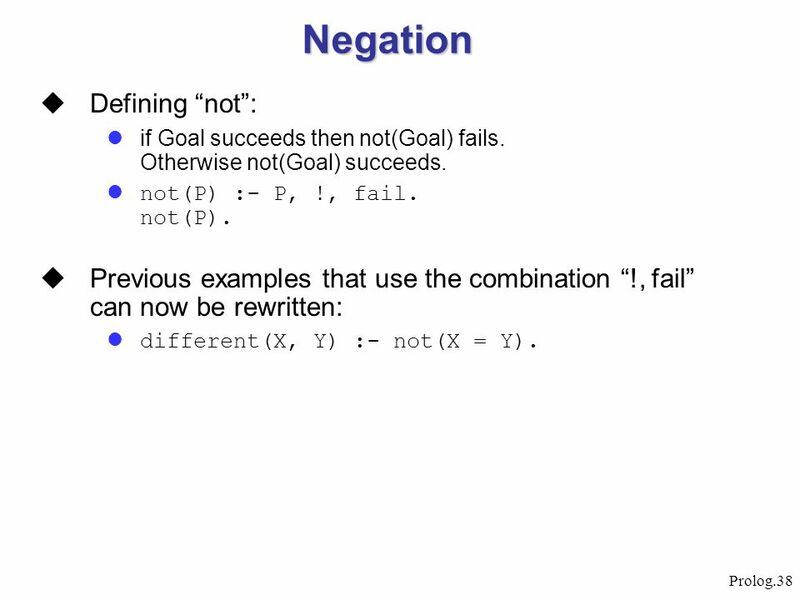 Previous examples that use the combination “!, fail” can now be rewritten: different(X, Y) :- not(X = Y). 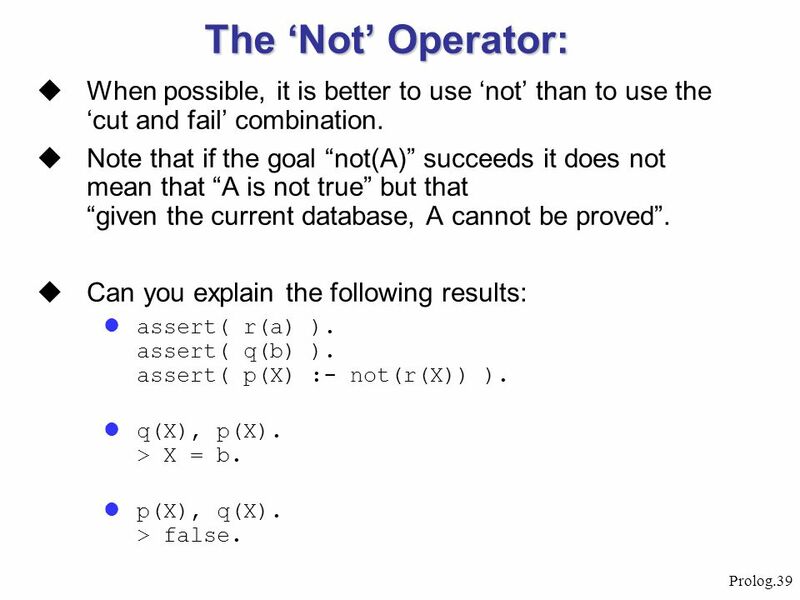 39 The ‘Not’ Operator: When possible, it is better to use ‘not’ than to use the ‘cut and fail’ combination. Note that if the goal “not(A)” succeeds it does not mean that “A is not true” but that “given the current database, A cannot be proved”. 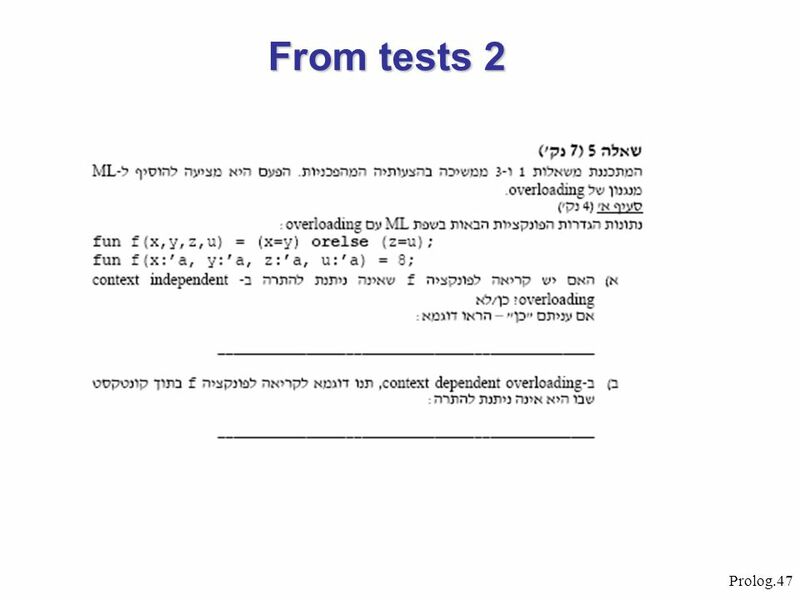 Can you explain the following results: assert( r(a) ). assert( q(b) ). assert( p(X) :- not(r(X)) ). q(X), p(X). > X = b. p(X), q(X). > false. 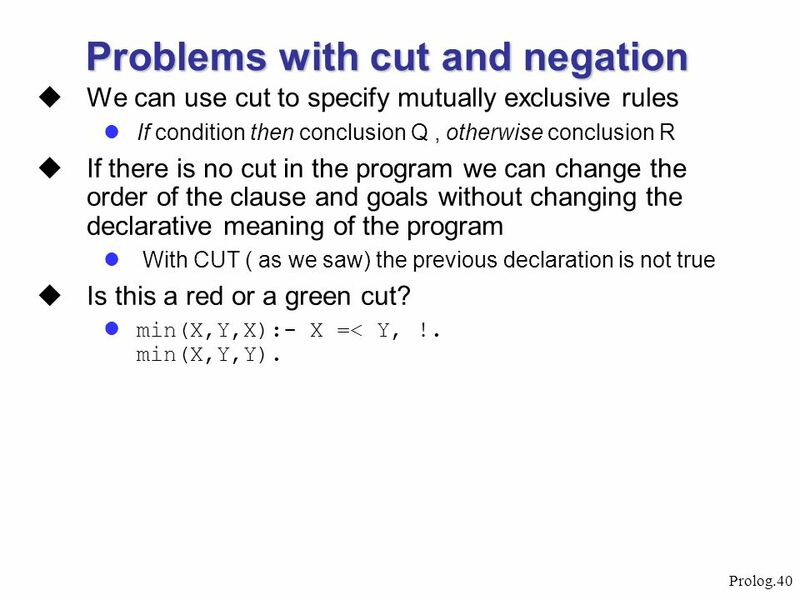 We can use cut to specify mutually exclusive rules If condition then conclusion Q , otherwise conclusion R If there is no cut in the program we can change the order of the clause and goals without changing the declarative meaning of the program With CUT ( as we saw) the previous declaration is not true Is this a red or a green cut? min(X,Y,X):- X =< Y, !. min(X,Y,Y). 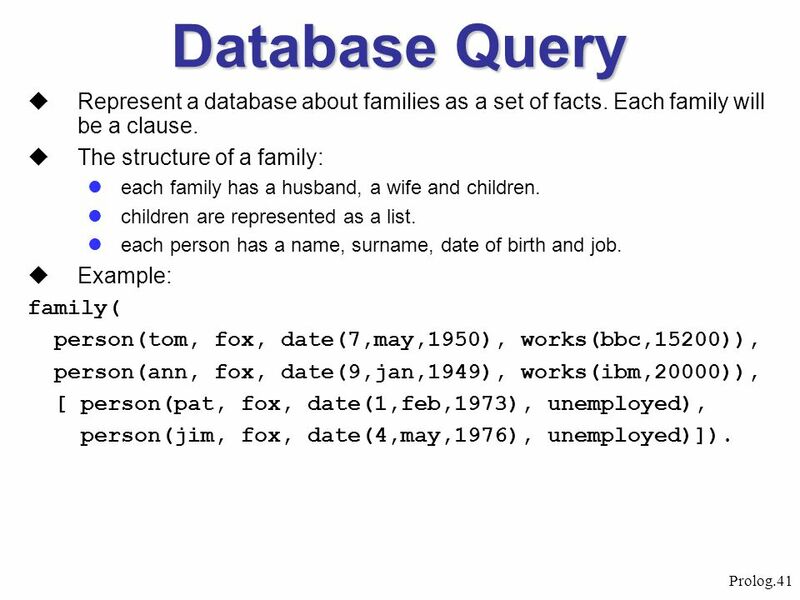 41 Database Query Represent a database about families as a set of facts. Each family will be a clause. The structure of a family: each family has a husband, a wife and children. children are represented as a list. 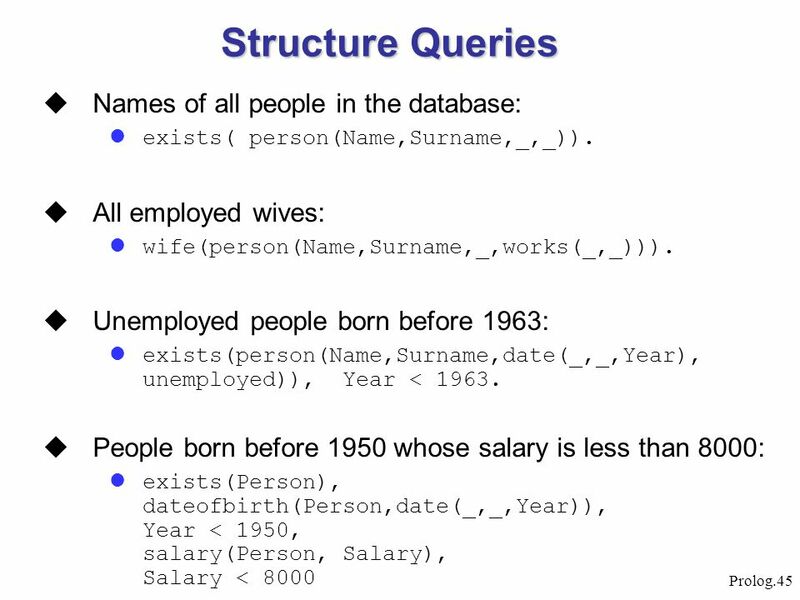 each person has a name, surname, date of birth and job. Example: family( person(tom, fox, date(7,may,1950), works(bbc,15200)), person(ann, fox, date(9,jan,1949), works(ibm,20000)), [ person(pat, fox, date(1,feb,1973), unemployed), person(jim, fox, date(4,may,1976), unemployed)]). 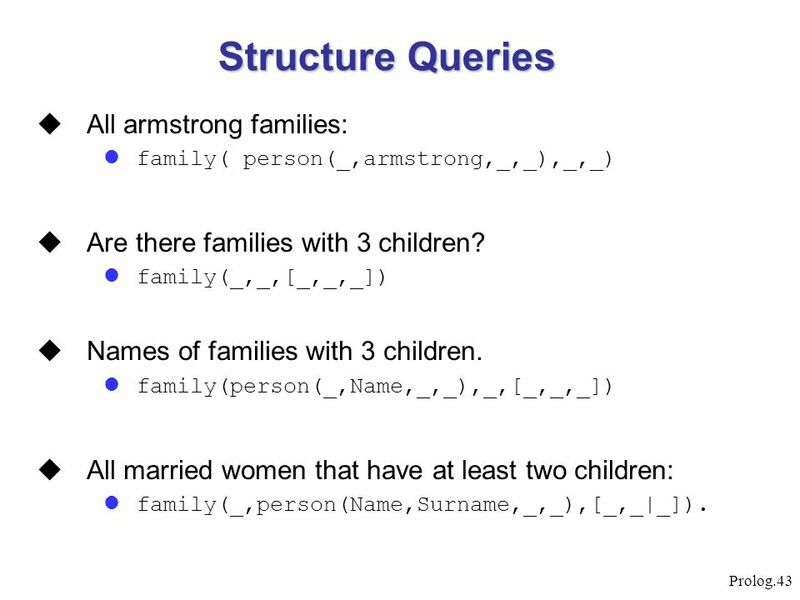 family( person(_,armstrong,_,_),_,_) Are there families with 3 children? family(_,_,[_,_,_]) Names of families with 3 children. family(person(_,Name,_,_),_,[_,_,_]) All married women that have at least two children: family(_,person(Name,Surname,_,_),[_,_|_]). 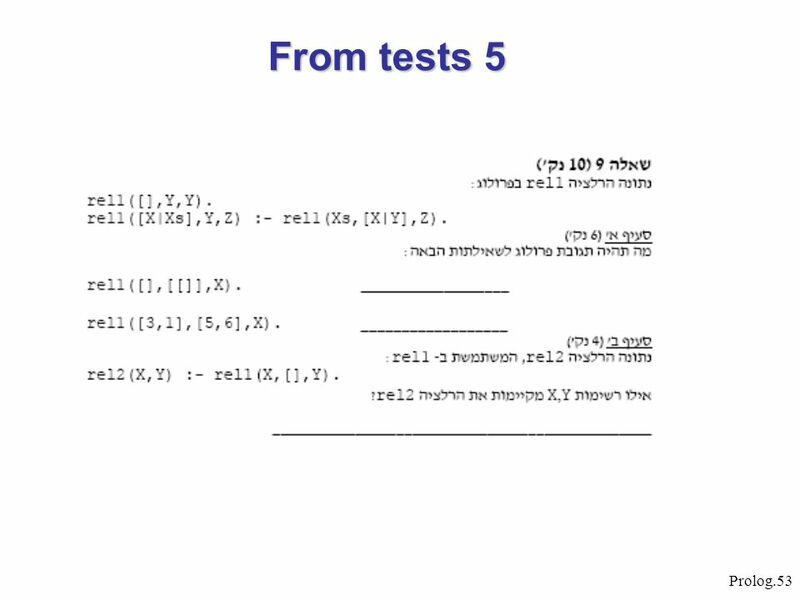 © Johan Bos Logic Programming About the course –Taught in English –Tuesday: mostly theory –Thursday: practical work [lab] Teaching material –Learn Prolog. 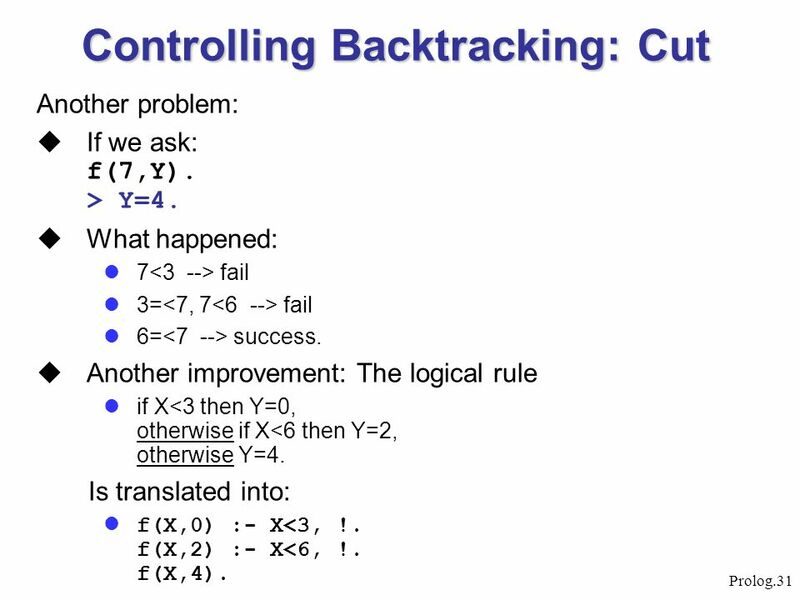 CS4026 Formal Models of Computation Part II The Logic Model Lecture 6 – Arithmetic, fail and the cut. 3. Lists, Operators, Arithmetic. 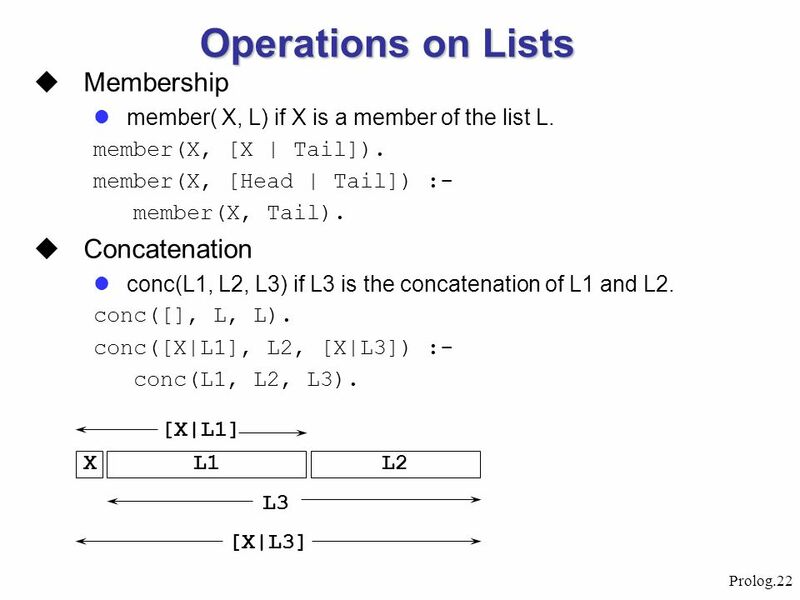 Contents Representation of lists Some operations on lists Operator notation Arithmetic. Prolog.1 Prolog. Prolog.2 Textbook and Software  Title PROLOG programming for artificial intelligence  Author Ivan Bratko  Get the software – windows. 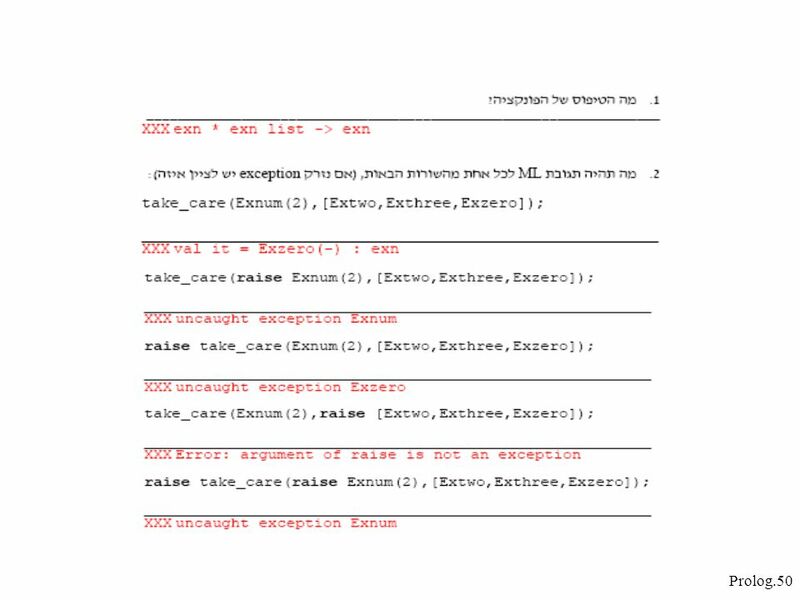 1 Part 1 The Prolog Language Chapter 2 Syntax and Meaning of Prolog programs. LING 388: Language and Computers Sandiway Fong Lecture 5: 9/5. Introduction to PROLOG ME 409 Lab - 1. 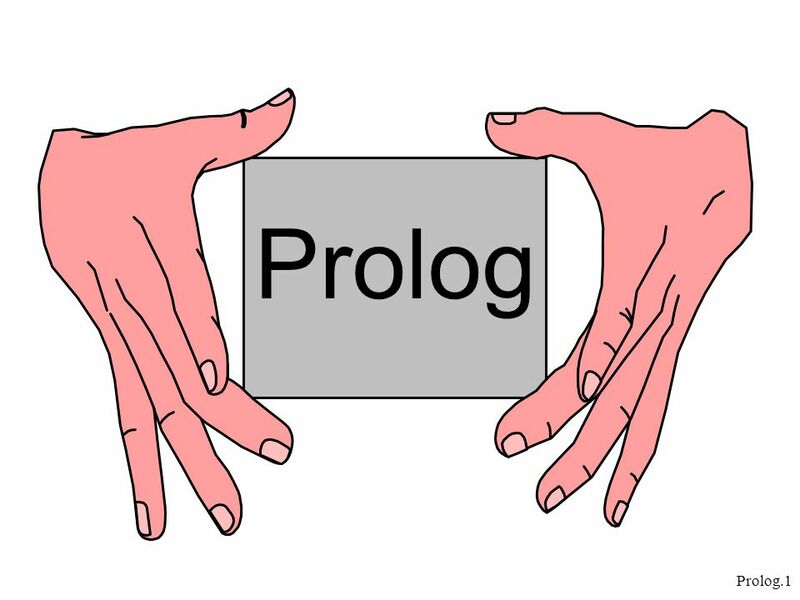 Introduction to PROLOG. 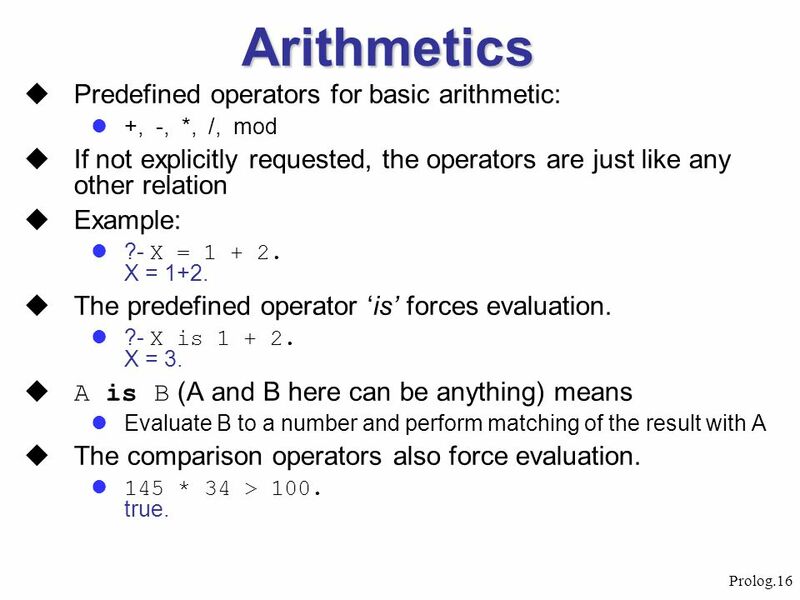 Chapter Three: Lists, Operators, Arithmetic CS 461. 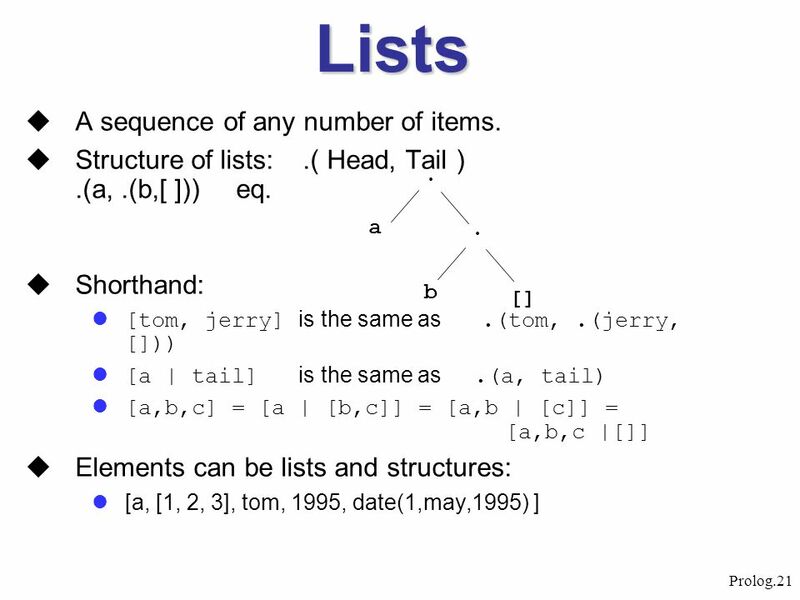 11/10/04 AIPP Lecture 6: Built-in Predicates1 Combining Lists & Built-in Predicates Artificial Intelligence Programming in Prolog Lecturer: Tim Smith Lecture. LING 388: Language and Computers Sandiway Fong Lecture 5: 9/8. Chapter Three: Lists, Operators, Arithmetic 1. Chapter three: 3.1Representation of lists 3.2Some operations on lists 2. 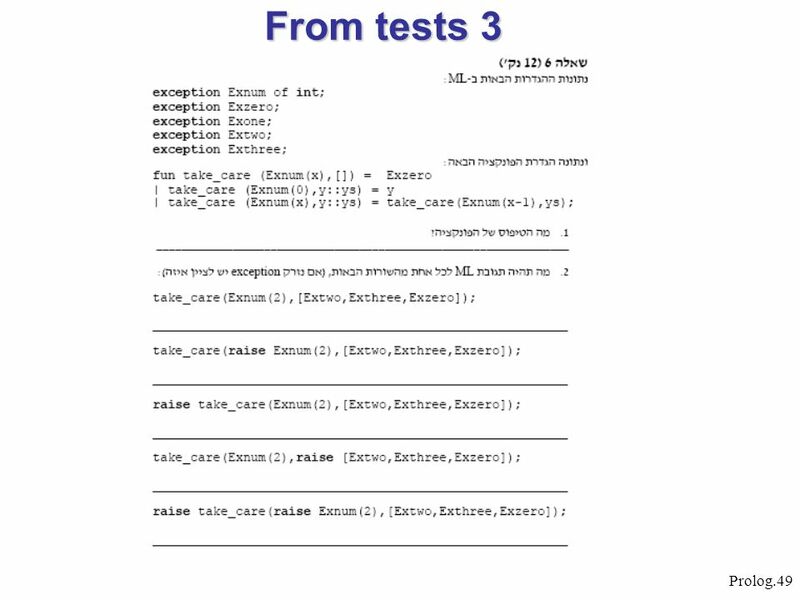 1 Introduction to Prolog References: – – Bratko, I., Prolog Programming. 1 Logic Programming. 2 A little bit of Prolog Objects and relations between objects Facts and rules. 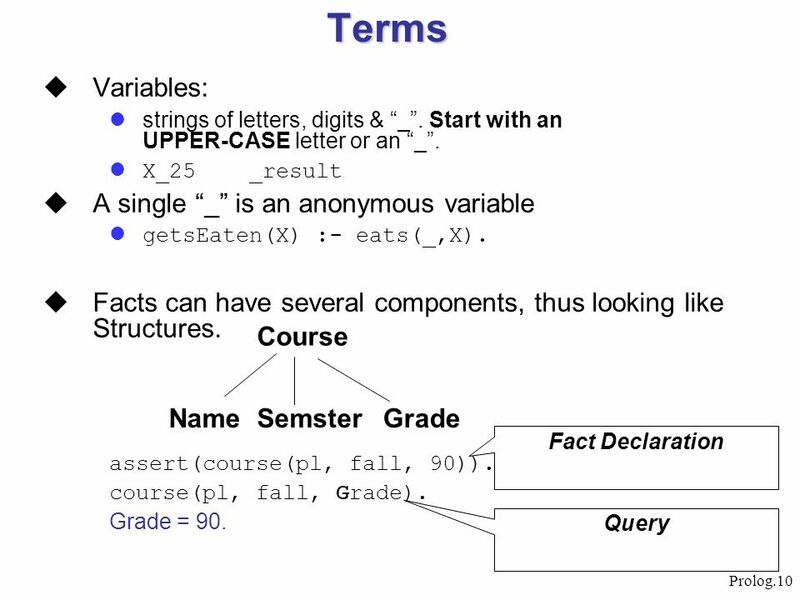 Upper case are variables. parent(pam, bob).parent(tom,bob). 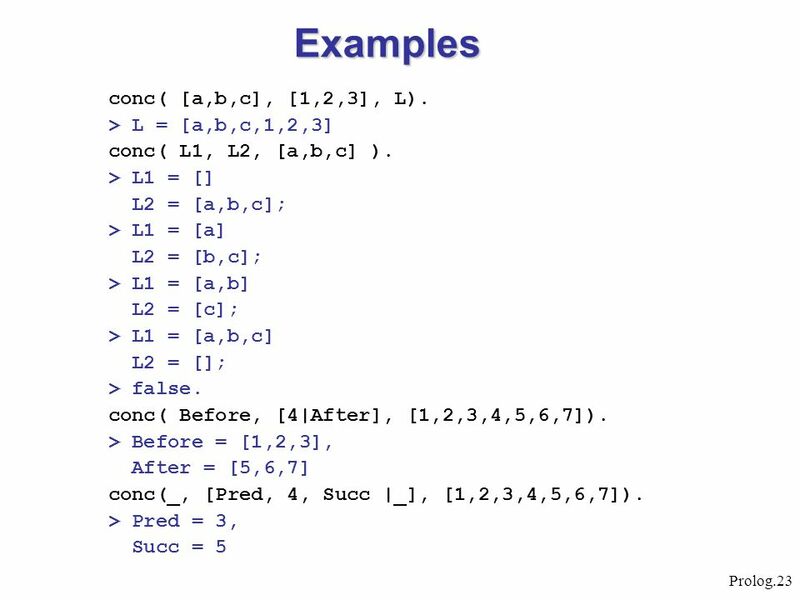 INTRODUCTION TO PROLOG. 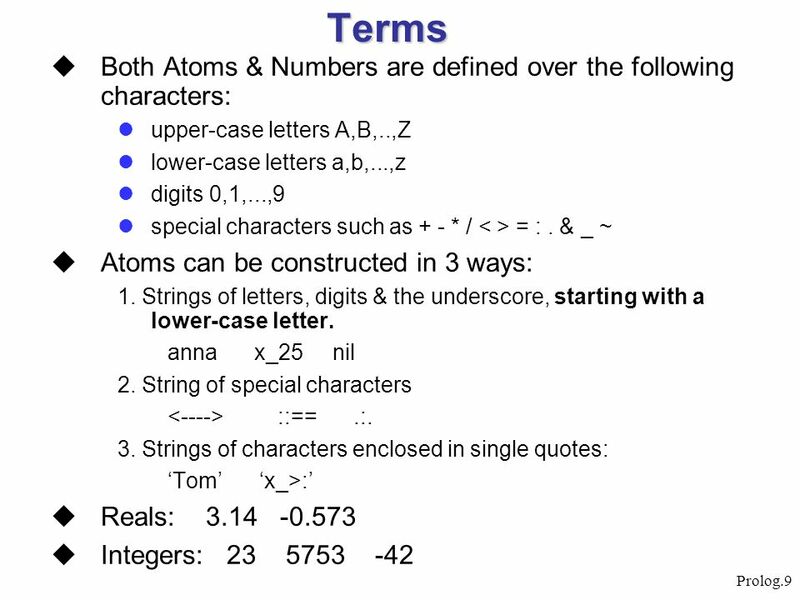 PROLOG BASICS Atoms - most primitive terms that the language manipulates start with lower case letter includes strings (‘inside. 2. Syntax and Meaning. 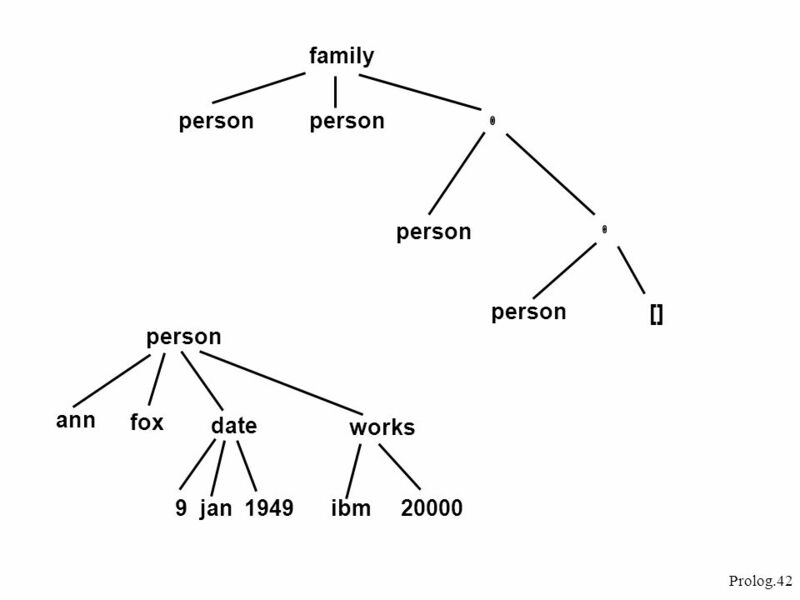 Contents Data Objects Matching Declarative meaning of Prolog Procedural meaning Example: monkey and banana Order of clauses and. 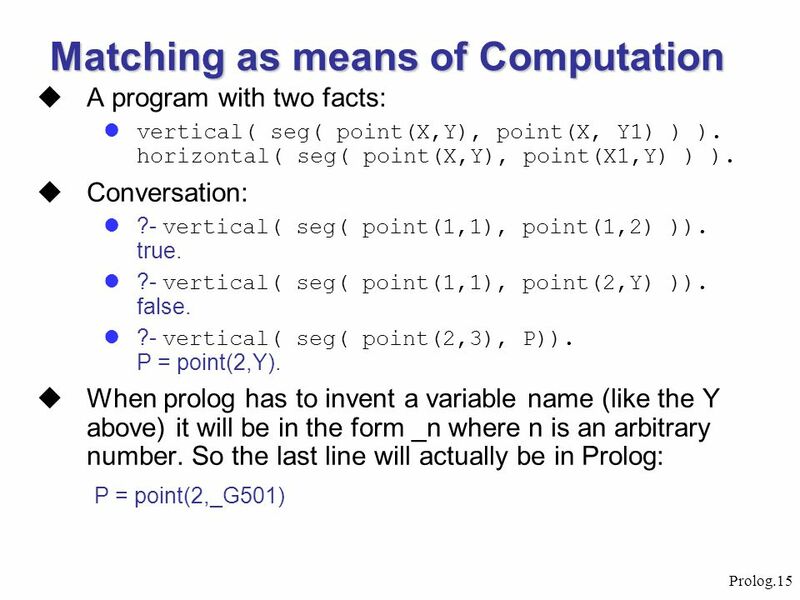 About prolog  History  Symbolic Programming Language  Logic Programming Language  Declarative Programming Language.